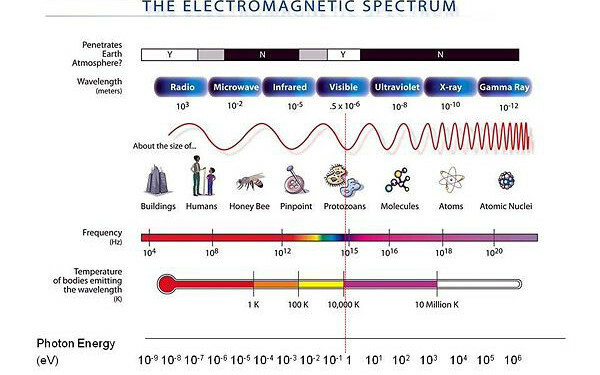 How can Energy Healing & Wavelengths from the Sky have any thing to do with the practical application of energy work. This is a first in a series of posts that will start to look at the science that supports the School of Chi Energy Cultivation Method for advanced abilities and healing techniques. Our School of Chi Energy Students and Instructors learn how biophotons (sometimes described as the messenger particle of the electromagnetic force) can be built up from the body’s nerve fiber system into a Energy Healing Form of Light. They perform a Nerve Fiber Energy Exercises that releases these biophotons that can be physically felt to guide with precision in a form that has tangible attributes of pressure and density which are good feeling and a cool relaxing temperature. Below is an interesting brief video that explains how “light wavelengths” carry information.This video shows how astronomers are observing light from somewhere on the electromagnetic spectrum, whether visible, infrared, ultraviolet, or another form of radiation. Griffith Observatory Curator Laura Danly explains how astronomers manage to translate that light into all of the information that we have learned about our universe in 400 years of stargazing.